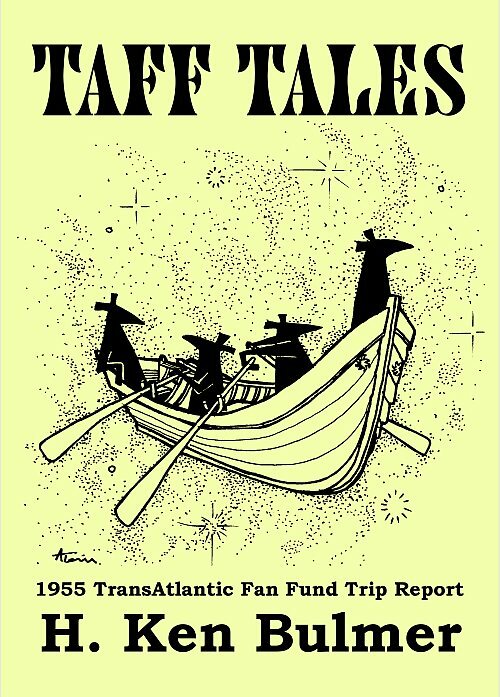 Ken Bulmer’s report of his 1955 TAFF trip, the first such report ever written (since Walt Willis’s celebrated trip report was pre-TAFF and the first TAFF winner Vince Clarke was unable to make the journey), initially published in fanzines and eventually assembled in 1998 as a single booklet from Dave Langford’s Ansible Information, with expansion and corrections in 1999. First published as an Ansible Editions ebook for the TAFF site in May 2015, with booklet cover art by Atom (Arthur Thomson). 16,600 words. • Details of the 1955 TAFF race and voting can be found here.